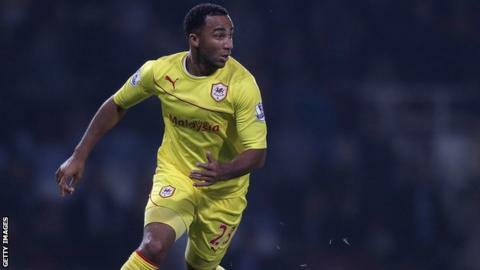 Nicky Maynard is set for a surprise return to the Cardiff City squad when they face Blackpool in their final Championship home game of the season. Striker Maynard, who has not featured since November because of a back injury, is out of contract this summer. Defender Ben Turner is also set to return to the Bluebirds squad. But midfielder Peter Whittingham, who was this week named in the Football League team of the decade, is missing with a calf problem. Manager Russell Slade says Maynard and others "effectively could be in the shop window" if they play. He added: "That's the whole point, to have people fit... whether they are here for another two years or whether they are available at the end of the season." Slade says Tom Adeyemi is "50-50" because of a calf injury, while midfielder Kagisho Dikgacoi may feature at Nottingham Forest in Cardiff's last game of the season on 2 May. The Cardiff boss described his side's home form as his "biggest frustration", with just two wins in the past 13 games at Cardiff City Stadium. Relegated Blackpool are without an away win in the Championship this season. Slade said: "It's a difficult fixture for us. "The respect you have for Blackpool now is they are playing with no fear and the players are playing for contracts and they have picked up points recently. "This will be a difficult game and we have to be up for that and we will be up for that." Should Cardiff City spend or save? Read more on Cardiff City: Should Vincent Tan and Russell Slade spend or save?